At Rapkyns Nursery there is something for all times of the Year, and with a bit of careful planning, an all year round garden can easily be achieved. Steven was always determined to have his own nursery, and jumped at the chance to buy a plot of land on the Rapkyns Estate near Horsham. I cleared all the trees on the land by hand in my spare time, and sold the resulting logs to raise enough money to buy Rhododendron plugs to plant out. Gradually, I built up the stock to include more of the plants I feel really passionate about, such as Salvias and Penstemon. 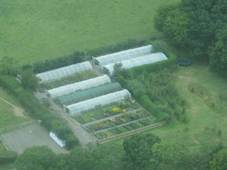 However, that first plot of land was not really large enough to run as a full-time nursery, so Stevens uncle offered him a piece of land on his farm in East Sussex. Fifteen years on, Rapkyns success is not only down to Stevens enthusiasm and passion for plants, but also about the undeniable quality of the plants he grows. Steven and his family, who are often called upon to help out, can be found at many events. There is always a good selection of plants that are in season with attractive flowers and foliage. Steven and his team arrange the plants in a way to give lots of ideas for planting up the perfect garden, and are more than willing to offer help and advice. During the winter, Steven is happy to visit gardens and discuss and design planting plans. 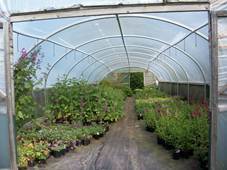 The best way to see the full range on offer at Rapkyns is by visiting the nursery. During the summer months, the nursery is an absolute picture with colour in every direction! 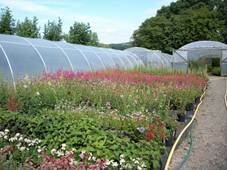 Rapkyns Nursery specialises in a wide range of plants providing colour throughout the seasons. 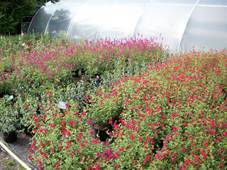 Some of Steven's favourites include Salvias of which at least 40 different varieties are grown. Also on offer are some 70 varieties of Clematis, 35 varieties of Penstemon, and 42 varieties of Hardy Geraniums! 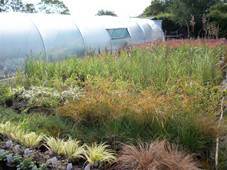 As well as many hardy perennials, some for early colour, with others reaching their peak later in the season, there is also a huge range of Grasses from the smaller Stipas to the giant Miscanthus. During the winter months the evergreens come into their own with scented bloom and interesting foliage providing the colour.